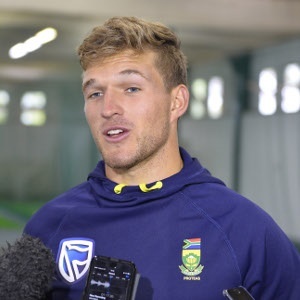 Cape Town – Based strongly on the blazing exploits of a player some 14 years his senior on Wednesday, South Africa have almost certainly freed themselves up to blood teenager Wiaan Mulder in the dead-rubber third ODI against Bangladesh in East London on Sunday. Both coach Ottis Gibson, and even more recently captain Faf du Plessis – the latter straight after the 104-run victory in Paarl for an unassailable 2-0 lead -- have confirmed that deliberate tinkering will be done to the XI at Buffalo Park. Safely read into that revelation, you would strongly imagine, that 19-year-old, Johannesburg-based all-rounder Mulder will get an intriguing maiden opportunity, in a match that should also see Test player Temba Bavuma earn an overdue chance to build on his century-making performance in a lone prior personal ODI against Ireland in Benoni last season. Those are the only two players in the squad yet to make a start and they will be primed for roles in East London’s first one-day international since the Proteas thrashed West Indies by nine wickets there in January 2015. Veteran crowd-thriller AB de Villiers ensured that the third game could become luxuriously experimental from a home point of view by blitzing his way to a career-best 176 on Wednesday in his first innings for the national cause in some four months. He holed out with 14 balls left of the SA innings, denying himself the potential opportunity to register just the seventh ever double-ton worldwide in the format, and also leaving safe Gary Kirsten’s record knock for the country of 188 not out against the UAE at the 1996 World Cup. The middle-order star was assisted in his destructiveness by another seasoned customer in Hashim Amla, who simply cannot put a foot wrong at present; he got 85 runs of his own and the pair amassed 136 together for the third wicket. There is a case for arguing, frankly, that Amla should almost be left out of the East London fixture on humanitarian grounds, such has been the consistent manner he has slapped the Bangladeshi bowling around on this broader tour by them so far. He has now followed up knocks of 137, 28 and 132 in the Test series with 110 not out and 85 in the ODIs and, considering that he is also due to play in the short Twenty20 series soon afterwards, a break on Sunday might not be a bad idea just to ensure that his hunger doesn’t wane through sheer crease fatigue! That possibility could open one of the opening spots to Bavuma – it is where he notched his 113 against the Irish from – whilst versatile youngster Mulder should find a place somewhere just outside the top six. That said, the final game is also a chance to gauge whether Andile Phehlukwayo, who bowled a cracking last spell in Paarl to earn career-best ODI figures of 4/40, has potential as a slugger a bit higher up the batting order than usually stationed – it seems the SA brains trust want to give the KwaZulu-Natalian greater responsibility with the blade. One player you can bet will not want to “rest” in East London – unless he has picked up a niggle or something – is skipper Faf du Plessis. He did not get to bat in the particularly lopsided first contest, and was bowled by Shakib Al Hasan for nought – just his third duck in 115 ODIs – on Wednesday, so the dead-rubber match is his opportunity to make a belated, meaningful personal contribution with the willow. Cobras seamer Dane Paterson has found his first two ODIs tough going (9-0-69-0 in Kimberley and 8.5-0-67-1 on Wednesday) but opening bowlers are currently in very short supply in the squad due to a plethora of injuries so he may get a chance for redemption on Sunday.